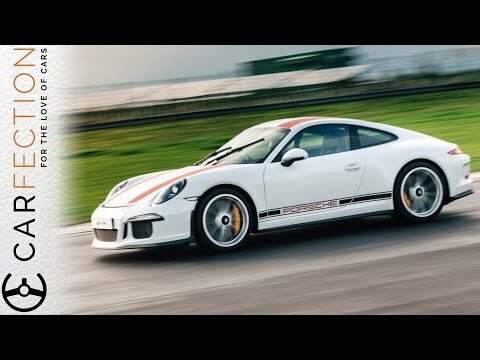 Not long after the recent Porsche 911 R was released examples were being sold for half a million dollars. The MSRP of the exclusive performance car started at $185,950, considerably less than what the 911 R would fetch shortly after its release. Recently, the special Porsche has started to come back down to earth. Where prices between $450,000 – $650,000 were common for a while prices have fallen to between $250,000 – $375,000 depending on condition and mileage. The Porsche 911 R proved that plenty of people would like a GT3 without a rear wing the size of one you would expect on a “rice rocket”. Sure it is an asset on the track, but many potential GT3 owners will rarely, if ever, take their cars on a track. Some folks want the naturally aspirated performance without all the extra attention that a GT3 brings. Simply put the R has all the performance and driving experience that you want for a twisty back road with more grown-up styling. So many people wanted the limited edition 911 R that prices have skyrocketed. Examples have been resold for over $1 million with average prices hovering around $400,000. That’s quite a markup from a car that had an MSRP starting at $184,900. When you think of that it’s kind of like a tangible Bitcoin for people that ready have roughly $200,000 (or can at least get auto financing for that amount).